This experience resonates with a lot of my friends, actors or no. “Once I had a job interview, so I wore high heels,” Grace told me as we headed out to a book reading in Brooklyn. “By the time I got to the subway my feet were killing me, and I really wanted to sit down. There was an old guy who was clearly just about to get up, rolling up his newspaper, buttoning up his coat. So I edged closer to his seat. And then I noticed. Another woman was doing the exact same thing. We stared at each other, waiting for one of us to back down, but I was quicker, and when the guy got up, I got the seat! I was a winner! I was feeling great! It was basically a metaphor for my interview – I would edge out the competition just like I edged out that other woman. I would get that job like I got that seat. Unfortunately, the other woman was my interviewer. To improve my Karmic debt, later, I made these lemon bars and gave her a box full. Lemon Bars are a two step process: First you make and bake the crust, then you top with lemon filling and bake again. Neither of these things is hard to do, it just takes a little time, so it’s the perfect thing to make if you have a clear hour, and something good to listen to on the radio. Grate the butter into a bowl with the flour, confectioners sugar and salt. Stir until the mixture resembles crumbs. Pour the crumbs into the baking dish, then press them together by hand to form the crust. This entry was posted in The Monday Treat and tagged interview, karma, lemon, lemon bar, luck, spring. Bookmark the permalink. I love the idea of training heels! 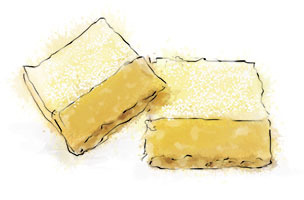 Hope you enjoy the lemon bars – they’re so bright and fresh, very Spring-ish.